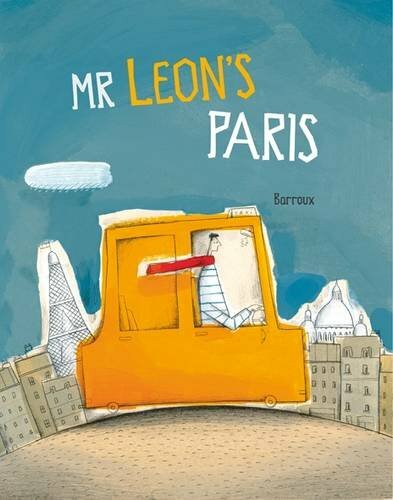 First published in France in 2011 under the title Le Paris de Leon, this highly original book takes us on an exhilarating ride across the streets of Paris in Mr Leon’s taxi. His passengers include all sorts of intriguing people whose names are often linked with the places they are collected from or destined for. This is the source of much verbal entertainment: for example Jeanette the hairdresser goes to Scissor Row and Captain Scott is picked up from Englishman’s Street. That the humour is retained is down to the skill of the translator, of course. The illustrations have a surrealist flavour: we have people with elongated bodies and tiny heads and splodges of colour sometimes eccentrically placed. Features in the urban landscapes are fascinatingly detailed: buildings have hundreds of windows, jaunty statues and tiny chimney pots. After thirty years of driving his taxi Mr Leon wants to move on and to visit some of the places after which the streets of Paris he has traversed so often are named. Children will love spotting them in the splendid picture map of Paris on the endpaper – drawn specially for this edition of the book. In short, this is a sophisticated and wonderfully amusing creation which will appeal to people of different ages.